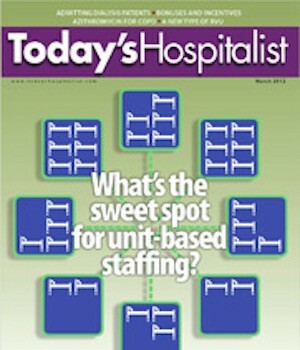 Home Cover Story What’s the sweet spot for unit-based staffing? What’s the sweet spot for unit-based staffing? WHEN THE HOSPITALISTS at Medical College of Wisconsin in Milwaukee did an internal review in 2009, they didn’t like what they found. The doctors were burning out, turnover was high and physician satisfaction was in a slump. But according to Dr. Singh, that internal review turned out to be “a blessing in disguise.” That’s because the group decided to cut the inefficiency and move toward unit localization, assigning at least 70% of the patients of several hospitalist teams to only four units. For years, hospitalists have pushed for unit localization (also known as geographic rounding) as a way to not only cut down on the miles they travel, but to build more effective teams and deliver higher quality care. 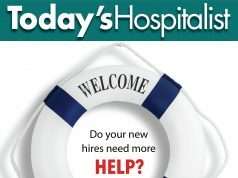 But according to Russell Holman, MD, chief clinical officer of Cogent HMG, “the idea of unit-based staffing is not solely coming from hospitalist groups” any more. “Because the model is becoming more prevalent, word is spreading throughout the industry, and we’re starting to hear an interest from nursing leadership, case management leadership and hospital administration,” Dr. Holman says. 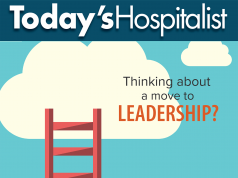 Executives are convinced that tighter teamwork will lower length of stay, reduce readmissions and boost patient satisfaction “and that localizing care is the linchpin innovation that can make all that teamwork possible. 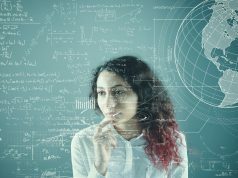 But while hospital administrators may be enamored of unit-based teams, they often underestimate the complexity of putting “and keeping “localization in place. Hospitalist veterans of geographic units wouldn’t go back, but they note that implementing the concept can put hospitalists on a collision course with other priorities within hospitals or within groups themselves. When the hospitalist group at St. Peter’s Hospital in Albany, N.Y., first considered going geographic, several doctors weren’t convinced. They worried that they’d miss the patient diversity that led them to internal medicine in the first place. They also didn’t want to deal with uneven workloads or patient acuity. Patients on the pulmonary floor, for instance, are on vents with PEG tubes, while doctors ruling out MIs and strokes could churn through 10 discharges a day. In 2009, the group ultimately opted for partial unit localization to be able to get manageable multidisciplinary rounds off the ground. But then group members “like other groups looking to localize “had to decide whether to split themselves into admitters and rounders to make localization work. That decision raised several questions: Should continuity of care for individual patients be a bigger priority, so doctors wouldn’t want an admitting team with at least one automatic handoff? Or did hospitalists want a more predictable workday and the ability to do multidisciplinary rounds at a set time, instead of being in the ED admitting a patient? At St. Peter’s, says Dr. Dalfino, it was a no-brainer: The group opted for the split structure. Not only do doctors in her group want to begin their day at 8 a.m. with a set patient list, she explains, but “the physicians want each list to contain basically the same number of patients.” By having admitters distribute patients to attending physicians the next morning, the group can keep each doctor’s census relatively even “and keep the physicians happy. 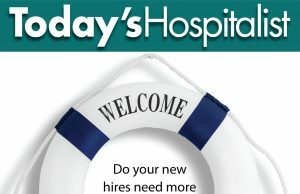 At Baystate Medical Center in Springfield, Mass., an admitting team likewise puts in all of a patient’s initial or holding orders, then assigns all patients out to a unit-based hospitalist the next morning. Rounding at Baystate, explains Roy Sittig, MD, medical director of the hospital medicine programs, is not based on units but on geographic zones that each encompass either one or two floors. Hospitalists on several teams have nearly 80% of their patients within one zone. Many of the admissions “particularly patients who arrive in the morning “are handled by a triage hospitalist, a position the group created after implementing regionalization and multidisciplinary rounds. But the triage hospitalist doesn’t wait until the next morning to assign patients to the hospitalists on the floors. Another key role of that triage hospitalist is working closely with the ED and nurse coordinators to find the best bed for admitted patients. The triage hospitalist calls the floors directly during the day to see where hospitalist beds are becoming available and to keep patient loads even. But therein lies what Dr. Dickens notes is the biggest struggle with regionalization: convincing colleagues and nursing staff to let the triage hospitalist spend an extra five (or even 15) minutes in the ED to find a bed in the hospitalist-only unit or on the regionalized floors. That time is well-spent, Dr. Dickens notes, because finding the right bed will save more nurse and physician time if patients are included in multidisciplinary rounds. But Dr. Dickens admits that he has to convince bed coordinators at least once a week that taking a few extra moments for bed assignment is the right thing to do. In some hospitals that are running at capacity, hospitalists find that they regularly lose that bed-assignment battle. Mary Frances Barthel, MD, is now medical director of the Cogent HMG group at Blessing Hospital in Quincy, Ill. With only two providers working during the day, she doesn’t think the group yet has the critical mass to consider localization. But her former job was as hospitalist medical director at Gundersen Lutheran Health System in La Crosse, Wis., a group Dr. Barthel continues to work with as a consultant. The program implemented some unit localization in 2010 and saw a quick jump in the number of patients placed geographically for each hospitalist team from 30% to 50%. Dr. Barthel says the group wanted to build on that “early win,” but the hospitalists’ push for more comprehensive localization ran into another major priority of the hospital: improving ED throughput. When hospitalists would advocate for sending patients to geographic units, other hospital personnel would want to send patients through to the first available bed instead. When the first-available-bed option slowed down localization, Dr. Barthel says the group opted for “workarounds.” One was that the group “which has 12 MDs and eight PAs “assigned a PA to a specific unit. While hospitalists would still be roaming the hospital to see at least half their patients, the PAs could stay put and participate in multidisciplinary rounds on a particular unit, even if the hospitalist wasn’t available. For the past few years, most hospitalists at Northwestern Memorial Hospital in Chicago have had their patients localized to one hospital floor, says Kevin O’Leary MD, associate chief of the division of hospital medicine. Since the beginning of this year, however, Northwestern has bucked the trend of regionalization and implemented what Dr. O’Leary calls “super localization” for some of its hospitalists. (To make it possible for physicians to stay within just those 15 rooms, the hospital also opted to split hospitalists into rounders and admitters.) It’s too early to tell, Dr. O’Leary says, if super-localized patient assignments will be a hit among doctors. But the model is running up against the way that nurses assign patients among themselves. The nurse-patient assignment barrier was likewise an issue for the hospitalist group at St. Mary’s Health Center, a community teaching hospital in St. Louis. The group, which is part of IPC The Hospitalist Company Inc., started localizing patients in one 20-bed unit in 2008, according to Philip Vaidyan, MD, the group’s director. That pilot project was so successful that the group continued to expand its geographic efforts. By February 2011, the group “with 12 hospitalists and four NPs “had enough of the patients in the hospital to localize about 80% of each hospitalist’s patients on one unit. But because nurses were assigned to patients based on acuity, not on who their doctor was, physicians still had to interact with many different nurses. To remedy the situation “and make the concept of unit based staffing more effective with MD/RN rounding at the bedside “the nursing leaders at St. Mary’s struck a deal: If the hospitalists could maintain 80% localization, nursing would allocate nurses to each unit-based hospitalist. At Northwestern, Dr. O’Leary reports that the nurses have already started considering “mapping their patient assignments to ours.” He hopes that staffing alignment takes place. But he also sees the potential for an unintended consequence down the road. The point of any localization, he points out, is to reap the benefits available from multidisciplinary rounds. Will doctors who work with the same handful of nurses every day still feel they need to hold formal daily rounds? AT MONTEFIORE MEDICAL CENTER IN BRONX, N.Y., the hospitalist group got a before-and-after snapshot of the effects of unit-based staffing. That’s because when the hospital expanded in 2007 and opened a new building, the one unit-based hospitalist floor that had been up and running for two years was lost in the shuffle. Matthew Shaines, MD, assistant director of the hospitalist service, worked with a research team to crunch those data. The team looked specifically at whether having a localized unit affected the time of day of discharges and patients’ length of stay. Researchers found no difference in those endpoints for most discharged patients. But in the subset of patients discharged to a skilled nursing facility, they uncovered a whopping length-of-stay difference of more than three days. Under the unit-localized structure maintained between 2005 and 2007, the length of stay for those patients was 7.46 days. In 2007 and 2008, however, it jumped to 10.94 days. That difference also highlights the advantages of hospitalist workflow in a localized unit. He also points to a trend that wasn’t statistically significant but compelling: Unit-based staffing was associated with lower rates of readmissions among patients discharged to SNFs. WHAT IS THE SWEET SPOT in terms of how many hospitalist patients should be localized in one unit? Siddhartha Singh, MD, MS, the associate medical director with Medical College of Wisconsin in Milwaukee, isn’t sure, but he knows what doesn’t work: localizing 100% of hospitalists’ patients to any one unit. That sounds counterintuitive. If it’s easier to regularly hold multidisciplinary rounds when 50% or 70% of hospitalists’ patients are all in one place, wouldn’t 100% be even better? But Dr. Singh and his colleagues led several studies when the hospitalists in his group were first piloting unit-based staffing and multidisciplinary rounds. For several months in 2010, Dr. Singh’s researchers maintained a closed 32-bed nursing unit, with all the patients on that unit cared for by two hospitalist-PA teams. The controls in the study were non-localized hospitalist teams in the same hospital who had the same caps on the number of daily admissions and patient census. When the researchers ran the numbers, many advantages of the localized unit became clear. Localized hospitalists and PAs traveled 20% fewer steps every day, fielded only 50% of the number of pages and were much happier. But Dr. Singh’s team also found this startling statistic: Length of stay in the localized unit was approximately 10% longer than both the hospitalists’ historical data and the non-localized teams. What’s behind that difference? Dr. Singh offers three hypotheses. One, hospitalists who can stay put can take on more work. When you’re not traveling, you’re doing more for the patients you do have or you’re taking on higher volumes. “Did we stress the teams so much with work that their efficiency decreased?” he asks, citing it as one possibility. Second, because doctors can spend more time with localized patients, were those physicians dealing with more issues for their patients that hospitalists might typically pass along to outpatient physicians? Or No. 3, and “this is probably the most troublesome to me,” says Dr. Singh: Because it was a closed unit, “was there some gaming of the system “whether intentional or not “for the doctors to just keep patients a little bit longer so they wouldn’t be overloaded with fresh admissions?” That’s a phenomenon that groups moving to localization should keep in mind, he points out, and protect against. In the real world since the study was finished, the group has been trying to locate 70% of the patients of three hospitalist teams on four units. Aiming for 70%, Dr. Singh says, is much better than 100% in terms of not trying to force the hospital to keep beds open or radically reconfigure nursing assignments.